UNITED NATIONS, January 14 -- A day after the UN's death count of its personnel in Port au Prince at first included a single Haitian staff member, and then dropped the reference, on Thursday morning Secretary General Ban Ki-moon dropped all reference to nationalities in his count of the dead. 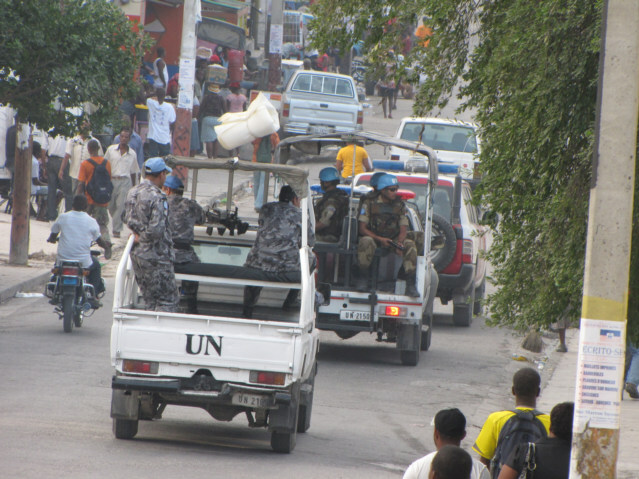 Inner City Press asked if the UN's national Haitian staff have been included in the figures the UN has been giving out, not only of casualties but even of how many people work for the UN. While Ban insisted that national staff are treated "equally," the figure thrown around - that 11,000 people work for the UN's MINUSTAH mission -- does not include the UN's national staff. In response to the question, Ban referred to notes and said that the UN has 1200 national staff in Haiti. This compares to 490 international civilian staff. After Ban left the stakeout, Inner City Press asked his spokesman Martin Nesirky to explain the UN's reporting of casualties. Nesirky said that the focus has been on reporting to those with international interest. He also said that national staff who worked in the UN headquarters in Port of Prince were somehow more likely to have already have left the building for the day when the earthquake struck. Video here. Now, he said, the UN is going out to the listed home addresses of its national staff to check on them. But will they now begin reporting the Haitians, equally, in their public statements? Watch this site. Footnote: after Ban and his spokesman left the stakeout, another journalist -- not this one -- marveled that the UN would focus on internationals and not Haitians, who are the people most impacted, and of most interest to her as a journalist. Inner City Press: I understand that now you are saying that the nationality of those killed will be given by the Spokesman. Yesterday it was mentioned that a Haitian national was among those who were deceased, and then in what you said yesterday evening, it wasn’t mentioned. Some questions have arisen whether the numbers the UN is given actually include the Haitians that are hired, the national staff. What is the figure, or what are the procedures for checking how the actual Haitian nationals employed in various functions for the UN are faring? SG Ban Ki-moon: In saving lives, there is no difference, no distinction between international and national staff. We have 1,200 national staff employed by the United Nations [in Haiti]. There seems to be very much a difficulty in communicating with all the national staff. Some of their houses have been affected. It is very difficult to account for all the national staff. We are doing, on the same principal: that we will try to save all the lives, without any distinction. Update of 10:26 a.m. -- on a Doctors Without Borders / MSF press conference call, Inner City Press asks for any information about the UN headquarters in the Christopher Hotel. MSF says the UN has been badly damaged, MSF does not expect much help from the UN as they will have to face their internal challenges. MSF says, unprompted, that it cannot confirm how the top leadership of the UN in Haiti has been impacted. But Inner City Press may have news on that, from a delegation. This is now a separate article, here. Update of 1:36 p.m. -- UN Spokesman Martin Nesirky ran a noon briefing whose only topic was Haiti. Top humanitarian John Holmes announced that a Chinese search and rescue team had already arrived in Haiti. This timing seemed extraordinary, so Inner City Press when called on near the end of the briefing asked how the Chinese search and rescue team got there so quickly, if they had perhaps been in the Caribbean when the earthquake happened. They came from Beijing, Holmes answered, adding that their speed is in part explained by Chinese interest in the "high level police delegation" that he confirmed had been meeting with Mr. Annabi. But China's Ambassador said they are only "on their way" -- through Vancouver, Inner City Press is told. Inner City Press asked him to confirm the Chinese delegation's meeting with Annabi and he did, but said "I have no more information." Afterwards, one wag snarked, "Google it." This afternoon there is another press conference, by UN Peacekeeping, and a stakeout by Ban Ki-moon. There is another, less publicized event that Inner City Press is looking into. Watch this space. Update of 2:33 p.m., North Lawn Conference Building entrance, fruitless Bill Clinton stakeout -- Ban's schedule was amended, to include a photo op with Bill Clinton at 2:45. But apparently the shots will be only by the UN's inhouse media. Several independents mill about in the back entrance of the UN's new building. "You can't put your laptop there," Inner City Press is told. Back in the (old) Conference Building, Mulet and Dmitry Titov are briefing Troop Contributing Countries. Ban will brief member states at 4, and do another stakeout for the Press at 5. It's all Haiti, all the time. But what is the UN accomplishing? Update of 2:52 p.m. -- twenty stray reporters, many with cameras, mill about on the raw cement floor of the UN's new building. Not a wisp of Bill Clinton who, it is assumed, will enter via the loading dock on 3B, elevator straight up to the Ban cave on the third. Still it's not without interest, seeing who comes in and out of the UN-KIA. One well placed source, headed upstairs, gives Inner City Press a heads up for a high profile attendee at the General Assembly's 4 p.m. meeting. More on this to follow. Update of 3:03 p.m. -- as Haiti's Ambassador to the UN walks into UN-KIA with his Canadian counterpart, Inner City Press and another journalist fall in behind him. The journalist begins, "Mister Ambassador, condolences, can you tell us--"
"I have no time," the Haitian Ambassador says. "I am going to a meeting." Inner City Press nods and followed, to (new) Conference Room 1. In the front, the Haitian Ambassador stops to kiss Anne Veneman on both cheeks. It's the UNICEF executive board meeting, not a meeting about Haiti. The work of the UN goes on. Still, one wonders if this is the best use of Haiti's top UN diplomat's time. Update of 3:08 p.m. -- "Thank you for being with us today, Mister Ambassador," Anne Veneman says. She will talk about Haiti and what UNICEF is doing. She's checked with the warehouse in Copenhagen. Water tanks are on the way, for 10,000 families. A DHL charter is being loaded in Panama, for 20,000 additional families. UNICEF will focus on children who have been separated from their families. The Ambassador of Zimbabwe arrives for the meeting. Update of 3:14 p.m. -- Haiti's Ambassador is now speaking, in French. In this new UN conference room, the seats on the side for the media do not have headphones to hear translation. Great planning. Update of 3:23 p.m. -- after Haiti's Ambassador, the floor is thrown open for any other member state. And who takes the floor? Luxembourg. Then, the item closed, UNICEF turns to resource generation. Update of 3:50 p.m. -- out in the hall of UN-KIA, Haiti's Ambassador greets Inner City Press. He recalls questions asked about abuse by and repatriation of Sri Lankan peacekeepers with MINUSTAH. Of Michele Montas, he didn't know she was in Haiti but will check. And we believe him. Update of 3:57 p.m. -- and now the news, such as it is, that Inner City Press held back upon request. Bill Clinton will speak to the General Assembly at 4 p.m. in Conference Room 4. All staff members, as well as the press, are sent up to the first floor gallery. In the hallway, DSG Migiro stops. Sad day. Her chief of staff Parfait says the same. Still there are many "Happy New Years" being exchanged in the hall. It's one last day, at least, of the old UN. But where is Bill Clinton? Update of 5:02 p.m. -- Top peacekeepers Alain Le Roy and Susana Malcorra put confirmed deaths -- of which families have been notified, they say -- at 14: 10 Brazilians (7 of them at Checkpoint 22, not in Hotel Christopher), three Jordanians and one Haitian staff member. When Inner City Press asks a spokesperson how many national staff the UN has in Haiti, there is no clear answer. On camera, Inner City Press repeats its noon question still unanswered, whether Port au Prince was a "family duty station." No, Ms. Malcorra says, UN international staff were not supposed to bring their families. But some did. (Inner City Press has reported on this phenomenon before.) On whether the Christopher Hotel was MOSS compliant, she says it's "a process," and aknowledges that improvement were in the budget. We'll have more on this. Bill Clinton and Ban were scheduled to appear for a stakeout at 5 p.m.. But down in Conference Room 1, the U.S. is speaking, through its Number Three Ambassador Rosemary DiCarlo. Update of 5:23 p.m. -- now Georgia's Ambassador is speaking, Ban on the podium looking pained. And, minutes later, Russia is speaking. Update of 5:44 p.m. -- and now, back to back, Venezuela and Colombia. Update of 5:55 p.m. -- now in the gallery / cheap seats of Conference Room 1. Bill Clinton nowhere in sight. On the podium: Mr. Ban, Ms. Migiro, Cameroon's Ambassador, Alain Le Roy and USG Shaaban Shaaban. In the second row, Kim Won-soo and Vijay Nambiar. That's the top UN officials, listening to repetitive speeches. Does this show their commitment? Is this the best way to be spending time? Update of 5:58 p.m. -- perhaps on this very topic, Mr. Ban whispers to Kim,Won-soo, who descends from the podium to speak to Spokesman Nesirky. Are they concerned about the ramifications -- in coverage -- of leaving the press waiting for more than a hour for the second time this week? Why continue to express surprise that things go slowly with the General Assembly, when everyone can speechify at length? Update of 6:02 p.m. -- Ban is wrapping up, saying he is humbled. Sad update, he says: FIFTEEN UN staff are now confirmed dead. Three Jordanians, 11 Brazilians, 1 Argentinian and 1 Chadian police officer. But that's sixteen! And what about the Haitian national staff member mentioned by Le Roy? And the other national staff members? 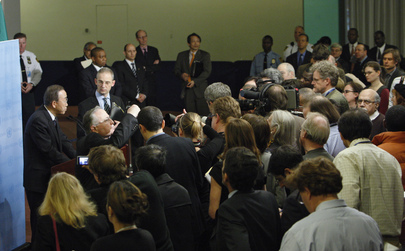 Update of 6:46 p.m. -- Ban Ki-moon came upstairs and did a stakeout, sans Bill Clinton. Now he used the number 16, but again did not mention the Haitian national staff member listed as dead by Alain Le Roy and Ms. Malcorra. Afterwards, Inner City Press waited to asked Spokesman Nesirky. Nesirky read out loud portions of an email from Michele Montas, that 80% of the city is destroyed. He said he assumes she would want this information made public. About the Haitian national staff member dropped between presentations by DPKO and Mr. Ban, he said he too had noticed the discrepancy and would look into it. We'll see.